The work of John and Robyn Ives on ‘Talaheni’, showcased yesterday at the ‘Soils For Life’ field day, was a huge vote for the benefits offered by decisions based on time spent monitoring. A self confessed eccentric with a background in ag science, John has applied his scientific methodology to getting to the bottom of some of the most pressing problems on his property. some of the best wool on the planet (based on wins in international competitions). Salinity Management in a variable landscape, CRC on Plant-based Management of Dryland Salinity, Salt Magazine. 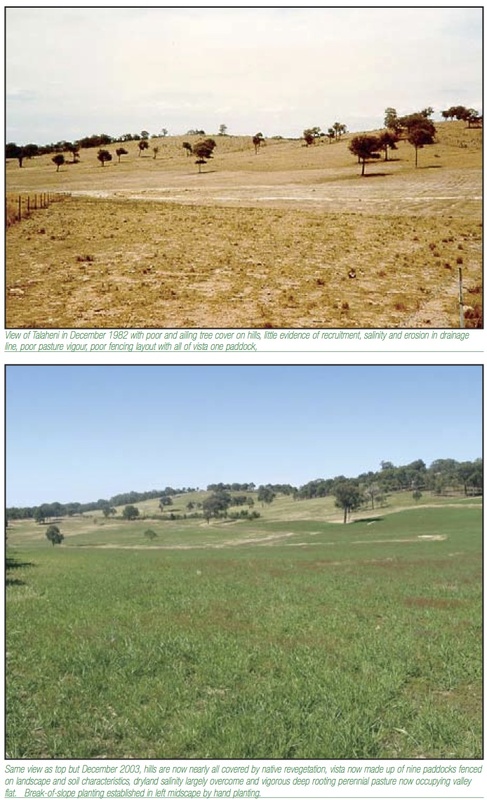 Can drought really help your revegetation effort?, John Ive, Agribusiness Chain 2007. Whenever I’ve heard Paul Newell’s name mentioned, there has been nothing but respect from those present. A lifetime in agricultural research and as a wheat and sheep farmer in various locations has lead Paul to be well qualified to develop ‘Landsmanship’, a practice, discipline and philosophy based on an ‘applied ecological’ approach to agriculture. Paul’s land management approach has been described as NSF (Natural Sequence Farming, a term which he coined) without bulldozers, with biological elements skilfully utilised in time and space to reinstate landscape function to essential soil, water, vegetation and biodiversity processes, within a productive agricultural environment. Below is a link to a paper on the Natural Sequence Farming website, written by Paul, along with esteemed ecologist, Professor David Goldney. This post is a pictorial example of how to apply P.A. Yeomans’ Keyline-patterning for deep ripping, direct drilling or tree planting. It is meant to hopefully help clarify the subject a little for those who’d like to apply keyline patterning to their landscape in some respect, as I’ve seen and heard a number of incorrect applications and explanations floating around the internet. Nice to have a few clearer digital images too. For a rundown on other aspects of Keyline design, a good starting point is to check out Abe Collins and Darren Doherty’s article, Keyline Mark IV, or visit Ken Yeomans site, http://www.keyline.com.au, where you can purchase Yeoman’s book, ‘Water for Every Farm’. If you would like to take advantage of the water distribution benefits offered by keyline pattern cultivation, identifying the keypoint and keyline are critical. The Keypoint is located where a primary valley (i.e. a new valley emerging from the side of a hill) begins to flatten out, obvious on a contour map by locating the point where the contours suddenly widen. Mark out a contour line from the Keypoint along the walls of the valley. Along that contour line, find the point where the valley walls are at their steepest (the narrowest gap to the next contour down on your map). This is treated as the boundary between the valley and ridge. That is the Keyline of this individual valley and it extends only to this point. From the end of your keyline, head downhill and just as you did for the keyline, find the path where the valley walls are at their steepest. This becomes the boundary between your valley and ridge for cultivation purposes. In the green area, cultivation is parallel downhill from either your keyline or the highest practical contour you can mark. All the blue areas, on the ridges and above the keyline are cultivated parallel uphill. In this image, the first line (red) was marked on contour. The remaining green lines were drawn parallel uphill from this point. As the arrows indicate, the uppermost line has clearly deviated off contour and is now running slightly downhill out towards the ridge. In this image, the first (red) line is once again on contour, the remaining ones running parallel downhill. Within the green zone, the arrows indicate that the lowest line is now running off contour, out away from the floor of the valley towards the ridge. As an illustration, applying this same treatment to the ridge will result in the opposite effect, with the lines actually draining the ridge as indicated by the red arrows. Hence, for ridges, cultivate uphill if you want to send water towards the ridge. If you’ve decided to rip a paddock to help ease 100 years of compaction (having properly assessed the suitability of the landscape for this practice), or you’re direct drilling for a Pasture Crop, it doesn’t take a great deal more effort to do so on a keyline pattern. Here’s how I go about it. Locate the keyline for each valley (if it’s in the paddock you’re working in) and the boundary between the valley and ridge for each. If you have multiple valleys, start with the one with the lowest keypoint. Mark a contour from here around the landscape until you hit a ridge-valley boundary. Cultivate (ripping, sowing, etc) in parallel lines up from this point, stopping at the next ridge-valley boundary if relevant. Once you’ve gotten up to the keyline of the next valley, you can just keep cultivating uphill in continuous runs. On large areas, your runs may end up becoming quite steep. In this case, it’s best to mark out a new contour and repeat until you get the boundary at the top of the paddock. For the ridges which are set between two valleys lower in the landscape (i.e. below the keyline), mark out contours to the ridge-valley boundary and, once again cultivate uphill. Follow the same common sense approach as pointed out before, setting out a new contour if your runs become steep and make your turning circle comfortable. Within the valley, start at the keyline and cultivate parallel runs downhill. Often, the turn will quickly become too sharp for the tractor, and if this is the case, just cut the corner like on the ridge. Re-set a new contour when the lines become steep. Keep going until you’ve ripped or sowed all you intended. Utilising keyline patterning for setting out tree rows can be very advantageous for any situation where equidistant rows are favourable, particularly where machinery is utilised in management of the inter-row. 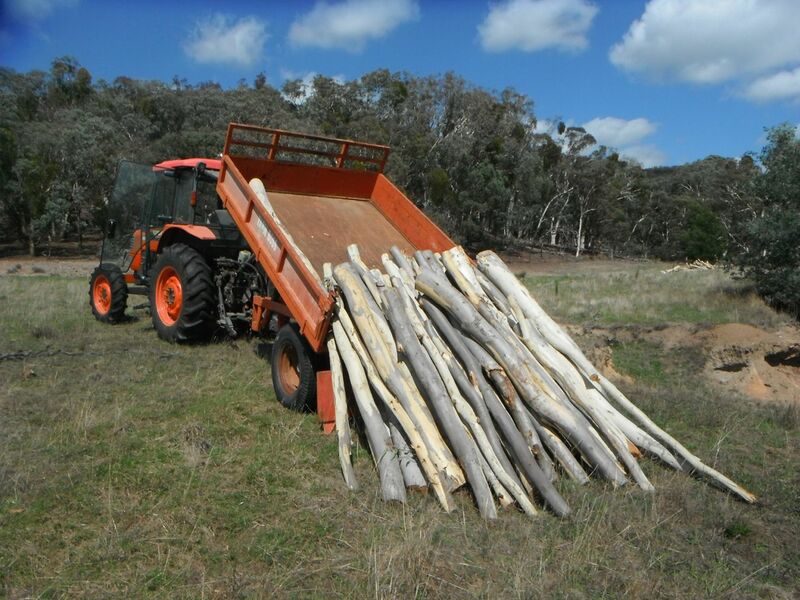 There are two well known proponents of this method: The first is Darren Doherty, (many would have seen the image iconic image taken of the Tree Crop paddock on George Howson’s agroforestry property, Dalpura Farm), Mark Sheppard is another. Here’s an example of how to set out a 4 lane tree belt using keyline patterning. Determine the upper limit of your tree belt and mark out your first contour within the uppermost valley, out to the ridge-valley boundary. Mark out the next few rows parallel downhill at your desired spacing, out to the ridge-valley boundary. Mark out your first ridge contour, starting at the end of your lowest row in the preceding valley. Mark parallel lines uphill at the desired spacing. Anywhere above the keylines is easy, just mark out your lowest contour and then run parallel rows uphill at your desired spacing. The same sort of approach can be taken for larger plantations, but there has to end up being some stub rows, or else the runs can get ridiculously steep and be erosion hazards in their own right. Before you do any sort of hillside cultivation or earthworks which encourage more water to soak into a hillside, make sure you check the local environmental conditions carefully, particularly the presence of dispersive or slaking soils, saline seepage or the occurrence of slips in the local region. Entire hillsides of topsoil have been lost by ripping in the wrong place. 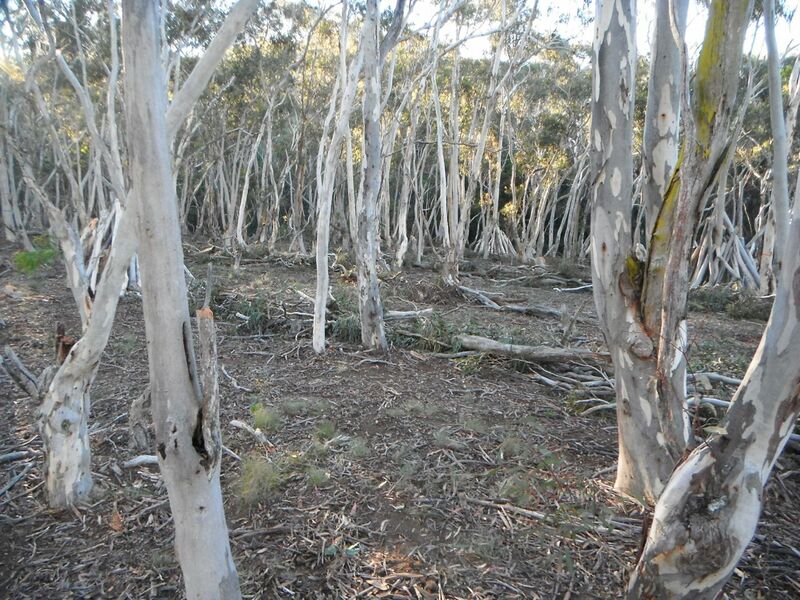 Regrowth dry-sclerophyll forest like you see below is a common sight across the Southern Tablelands. It would be fair to estimate this growth at 10-15 years old, but in actual fact, the trees in this image at Mulloon Creek Natural Farms (MCNF) were all dated by an ANU researcher at 80 to 100. This forest is stagnant and moribund. It’s a common story: hillsides were ringbarked, grazed and burnt repeatedly by early pastoralists of the region, until it no longer paid to do so (i.e., the decent soil was gone). With an even race for the light, the young Eucalypts take off (in this case the epicormic regrowth from the last ringbarking effort), but when the canopies of the closely spaced trees touch, they basically hit pause, limited by competition for nutrients, moisture and light. Unless you’ve got the right species and are after coppiced poles, this result isn’t good from a number of perspectives, whether it’s sawlog production (insufficient size), habitat (lack of hollows and minimal niches), or soil conservation (exclusion of grass and shrub groundcover) to name a few. Research carried out by students of ANU Professor John Field showed the effects of various treatments (thinning, exclusion, disturbance & fertiliser) on the health of the forest (stand basal area, and diversity of species). See the abstract of their findings at the bottom of this post. These studies have informed the guidelines for carrying out Private Native Forestry (PNF). This legislation provides a sensible set of guidelines to forest management which allows a good balance between production and ecology. Even low quality timber from a forest like this can be put to some good uses (I’m particularly interested in erosion control uses, but poles, posts, firewood, mushroom cultivation, mulch, & charcoal are a few obvious other uses) while at the same time, the health of the forest as a whole can be improved, providing environmental benefits to the landscape below and potentially the surrounding climate. The PNF regulations allow this work to be carried out without the risk of massive fines, and a PNF Property Vegetation Plan can be easily obtained (find out more here). The following are a series of images taken at Nanima Gold, the property of Mike and Denise McKenzie where we’re carrying out some gully repair work. Pre-felling, trees are marked as either existing habitat or recruitment trees under the Private Native Forestry guidelines. Trees are thinned to a given basal area depending on the forest type. Following the removal of any logs over 80-100mm, the remaining brush can be thrown five metres either side, creating 10m wide contours which snake around the landscape (as a quick way to mark rough contours along a slope: stand downhill, hold your arms out straight, stick your thumbs up and you’d be surprised how accurately you can find your next mark). The brush contours become more important the barer the understorey, such as in this older project I built for The Mulloon Institute. In that particularly degraded piece of forest, the bare path in the centre of this photo was caused by flash runoff, carrying soil and organic material downhill. After one decent downpour, this brush contour collected a significant amount of soil and organic debris, acting like a hillside leaky weir. When you create conditions in which worms are happy inside a dead forest like this, you know there’s a reasonable chance you’re on the right track. I wish I could press fast forward and see what the result of these brush contours is in 50 years time. More studies have shown the formation of hydrophobic (water repellant) soils under some Eucalypts. This is believed to be caused in part by mycorrhizal fungi, which help to direct moisture towards the roots of the associated Eucalypt, while creating unfavourable conditions for establishment of any competition. The following pictures were taken after 80mm of rain, illustrating the extreme hydrophobicity in the Eucalyptus rossii forest at MCNF, pictured above (click on an image for a larger view). A 50mm layer of predominantly decomposed organic matter just below the litter. 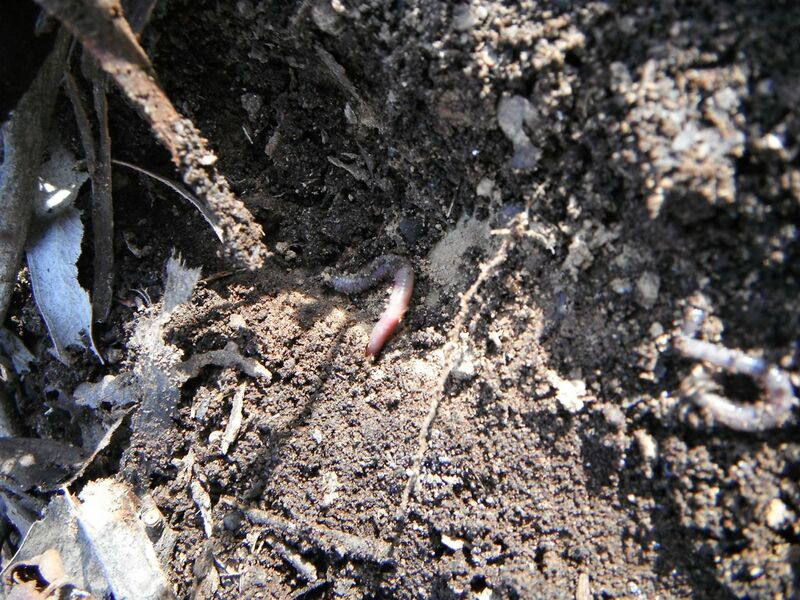 Therefore, in these conditions the seeds of understorey grasses and shrubs either don’t have the moisture to trigger germination in the first place, or if they do germinate, they have to fight through 50mm of bone dry material to get any moisture. Hence, the relatively bare forest floor in the pictures above. With this in mind, an extra layer of disturbance which may be useful in promoting under storey establishment is the short term integration of pigs, their rooting action helping to break up the fungal mats and reduce competition while grasses and ground covers establish (the pigs having moved on of course). Disclaimer: To avoid hefty fines, ensure you follow relevant local legislation. No person should rely on anything contained within as a substitute for specific professional advice. You can visit and ‘Like’ our Facebook page to hear about future posts. Simon Roberts, Chris Chartres, John Field & Chris McElhinny, 2006. 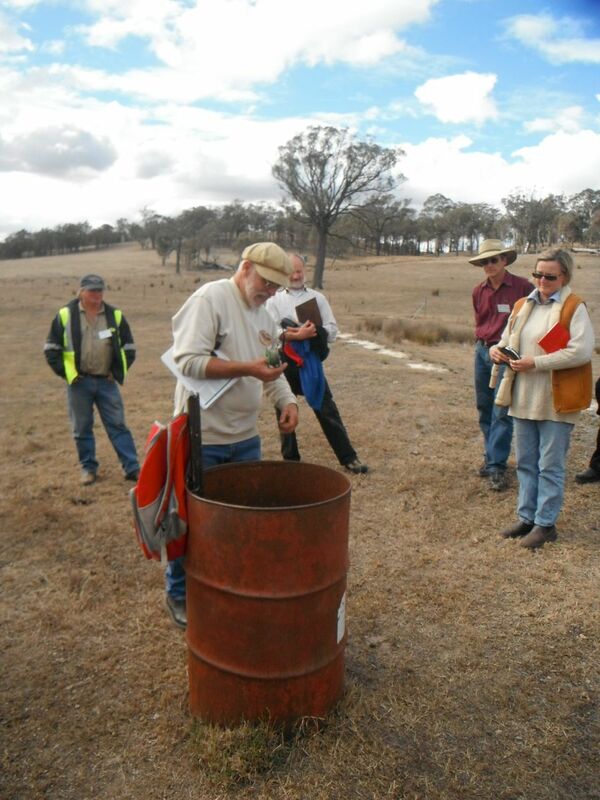 Forestry Program, SRES, ANU, ACT. 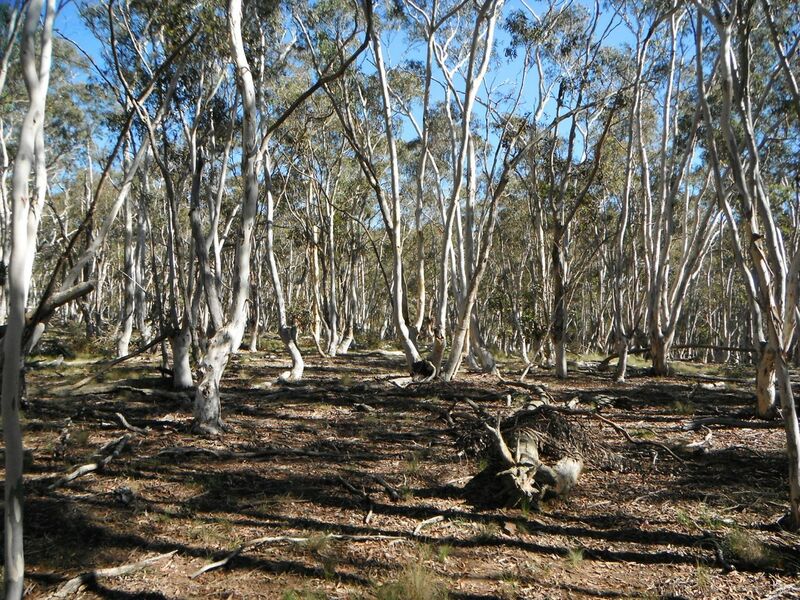 Regrowth stands of dry sclerophyll forest extend from Central Victoria through the NSW Southern Tablelands to Southern Queensland (Field and Banks 1999). 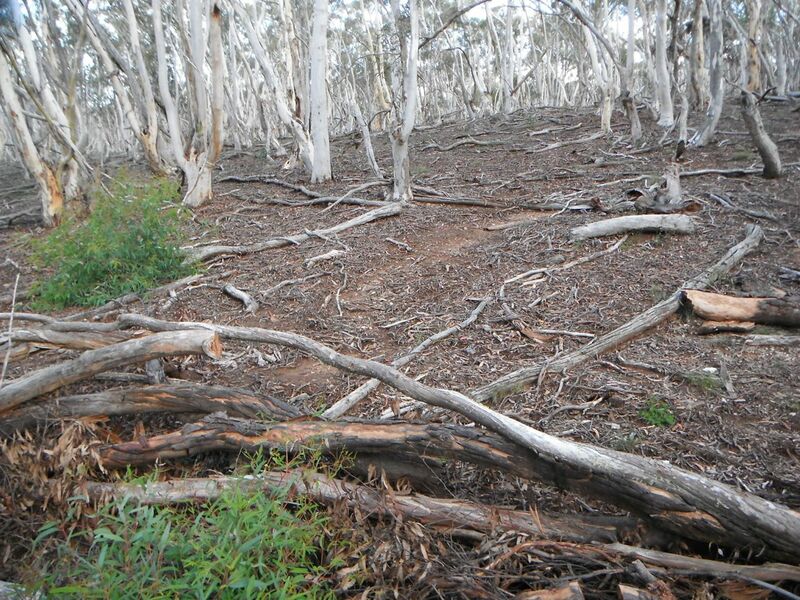 The ‘Mulloon Creek’ property, 15 km east of Bungendore in NSW is representative of this forest type. In the past, the property was extensively cleared (1890’s, 1920’s and 1950’s) and grazed (until the early 1980’s), and now supports a regrowth forest possessing a degraded structure compared to its predicted pre-European state. In 1991, Field and Banks (and others) established a silvicultural experiment to investigate the effects of different treatments on this forest. 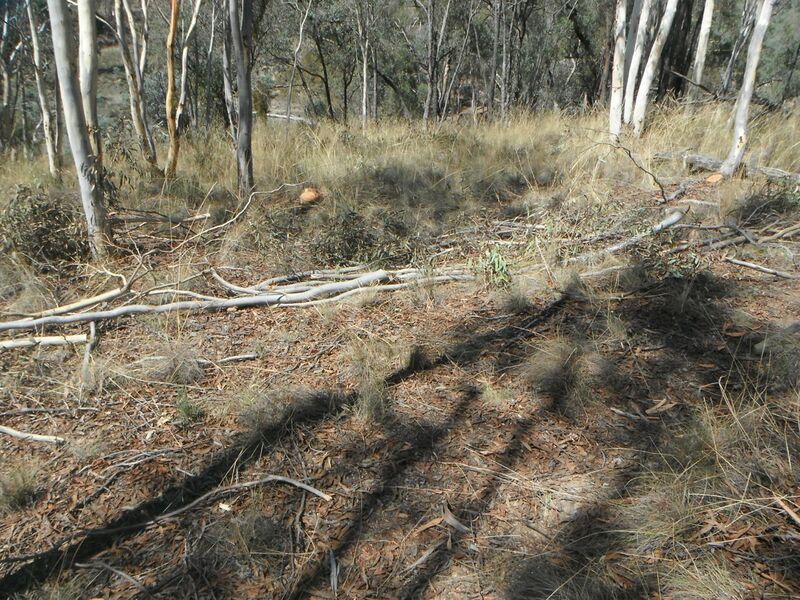 Their preliminary findings (Field and Banks 1999) indicated treatments such as thinning and burning had little effect on overstorey or understorey growth, however fencing to exclude grazing by native and feral herbivores promoted the establishment and growth of understorey plants. 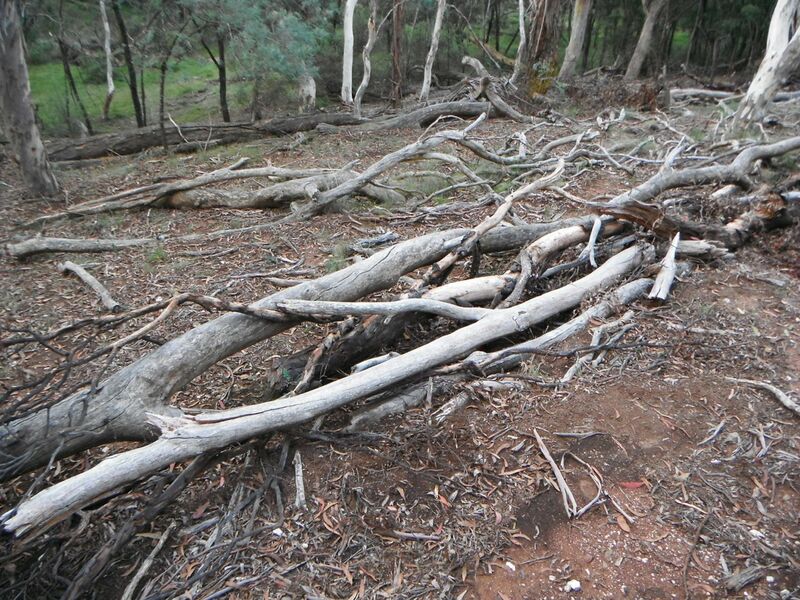 The long term results, however, demonstrate that these silvicultural treatments are effective management techniques. One-way analysis of each treatment on the overstorey (statistically in isolation of each other) reveals that thinning and burning both had significant effects on Relative Growth Rates (%BA Increment/Yr). The effect of thinning on the treatments had the most significant impact on tree growth. Over the twelve year period however, the burnt treatment had a significantly greater percentage annual basal area increment. Unlike thinning or burning, the effect on relative growth rate of exclusion fencing is not significantly different. Similarly to fencing, fertiliser had very little effect on relative growth rates of trees at the end of seven years since the application. The understorey results were evaluated in a similar way. 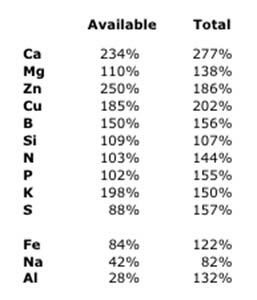 Only the fences treatment had a significantly higher mean richness of perennial species (21) compared to the unfenced treatment which had only 14.5 species. 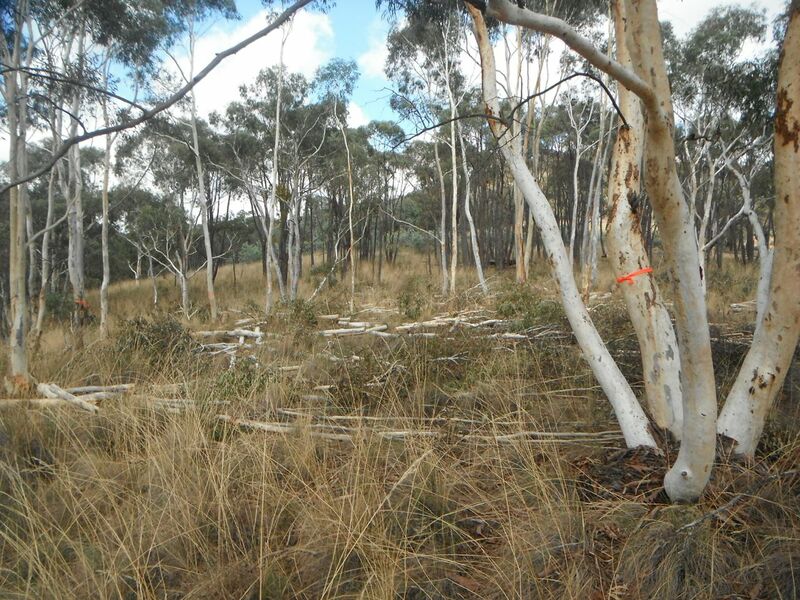 Fencing to exclude grazing animals has long been regarded as critical for the regeneration of native understorey plants. Building on the success of their well-respected business Terra Preta Truffles, the Marshalls have planted a further 5 ha of truffle orchard this season (click here for a virtual tour of Sunningdale). The system includes a wide variety of oaks, sourced from the Canberra region, interplanted with hazels which provide a shorter term truffle return. Under the guidance of top mycologists, the trees have been propagated and inoculated on farm this time around, partly because of the availability of truffles for inoculant, but also due to the very mediocre (and no-doubt concerning for many) results in the findings of a recent ANU study on the Australian truffle nursery industry. Click on one of the images below for a slideshow of how we went about planting each of the valuable trees in ‘Mari’s Montado’ (named after Mari Korhonen who spent six months with the Marshalls last year and planted a good portion of this paddock). A newly planted 5 ha mixed-Oak and hazel, truffle inoculated dehesa. The agrowplough shanks down 400-450mm. 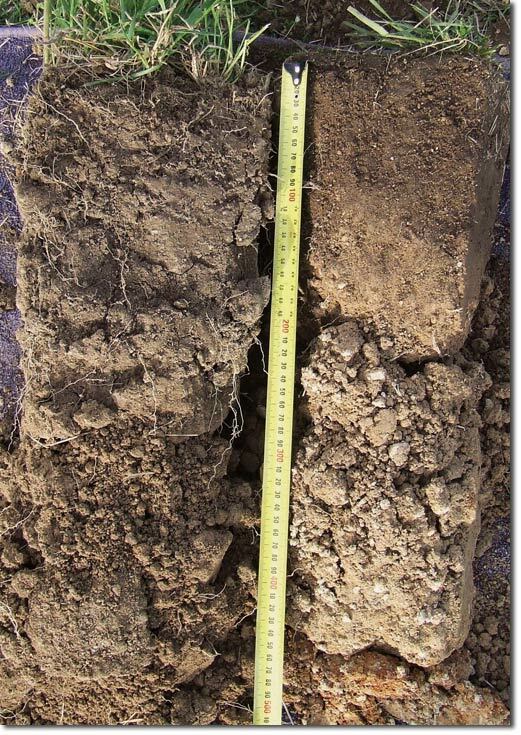 After a century or so of cropping, this soil was close to concrete 15 years ago. When you can do this with a post-hole shovel without any effort, you know the ground is in pretty good nick for a young tree’s roots. This is the result of a series of passes with the ripper, creative management of broom, and a crop of millet the Summer before. Friable soil to depth not only gives young trees quick access to moisture deeper in the soil profile, it also makes life easier for these guys too. A quick flip with the shovel further loosens the soil, and brings the mineral soil to the surface, resulting in far less weed germination. A range of oaks were planted in this system, collected from the arboretum that is the city of Canberra (including behind the PM’s house) and inoculated with many kilos of truffle from last season’s harvest under the guidance of top mycologists. A few upturned bits of sod for mulch will see this tree into a very healthy and productive future. A quick glance back along your row makes sure that tractor maintenance work is more ‘straight’ forward down the track.